Sun is going on vacation, Clouds will look like cinder. Snow is gonna bless us soon, be prepared it’s winter! Ho! Ho! Ho! Winter has come! Mmm… Winter mornings! I know it’s so difficult to get out of your nice fluffy blanket and get some distance from your lovely bed. But duty calls! So what if I say you can remain comfy all day and still remain perfectly warm away from your bed. Oh wow! Cool, so let’s have some fun with your winter wardrobe. What?? Just because it’s winter and you need the clothes to cover you fully it doesn’t means you can’t look stylish and classy. You can have some amazing fun with your winter wardrobe. Here are some Cute Winter Outfits with Sneakers that will keep that chilly breeze away from you and will make you look a pretty sporty too. Sporting the stylish hair colours for a different look isn’t a bad idea too! You can have a lot of different outfits with your denim jeans. You just need to simply pair it with different shirts and tees. And of course, jackets! Denim jeans with white sweater, cute grey beanie and white sneakers will give you a casual look. Add a brown scarf and you are ready to face the chill. Either that or reverse the idea. Pair a denim jacket with skinny black jeans and complete the look with white sneakers. Leather gives you an appealing look. You can match it with different blouses. Try leather pants with a white shirt and grey sweater over it. Top it off with a beige jacket and you get an amazing outfit. Wear a classy rose gold watch and let your hair blow with the wind. You can also go with jeans and stripped t-shirt and a brown leather jacket. Add a monochrome scarf with it. Keep your hair loose or you can attempt a high ponytail with it. In fact, enamelling and detailing nails with stylish manicure inspirations to make the look much attractive is going to be best trick to try. Want a cute winter dress then try for knitted dresses. A knitted red dress with black tights and black high top sneakers will do. You can either keep your hair down or can make a bun as per your mood. Thinking about what to wear to office? Then you can go with a grey sweater dress and navy pashmina scarf. Make your hair into a high bun and you are ready! How to wear ankle boots this fall and make the attire just dashing and casual is another concept ruling in fashion industry along with the converse concept. Puffer jackets are going to save you in winter. You can get any color that you like and you get nice casual look in it. 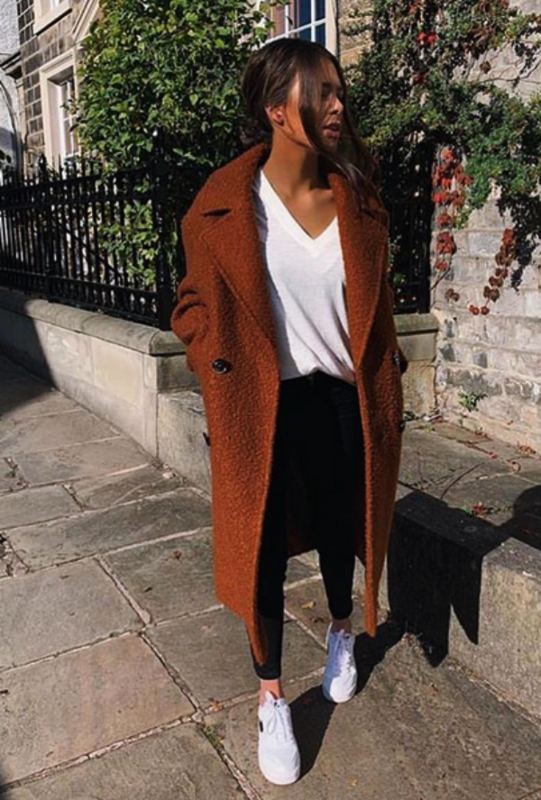 A black puff coat with cute brown beanie and white sneakers will look so great. Brown jacket, black jeans and wear your favorite sneakers. Or better get a red coat. No, umm blue. Wait, try navy blue. Or purple maybe. Uhhh! Just go and grab what you like.